Beacon Press: Martin Luther King, Jr.
Dr. Martin Luther King, Jr. (1929–1968), Nobel Peace Prize laureate and architect of the nonviolent civil rights movement, was among the twentieth century’s most influential figures. 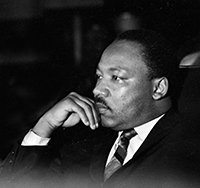 One of the greatest orators in US history, King also authored several books, including Stride Toward Freedom: The Montgomery Story, Where Do We Go from Here: Chaos or Community?, and Why We Can’t Wait. His speeches, sermons, and writings are inspirational and timeless. King was assassinated in Memphis, Tennessee, on April 4, 1968.